View from Cotalo, Ecuador, of the Tungurahua volcano on Saturday. 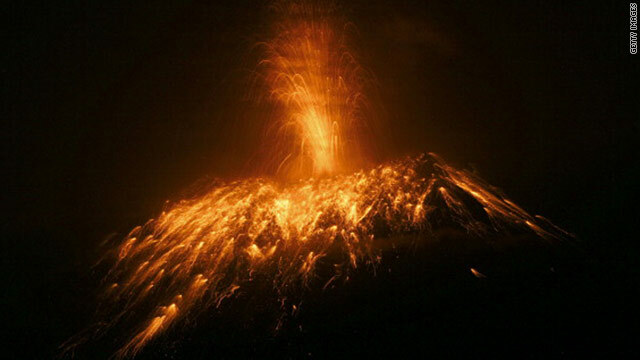 (CNN) -- Ecuador's Tungurahua volcano erupted Saturday, sending ash and lava spewing nearly a mile into the sky. Residents evacuated the area after the country's National Agency of Risk Control issued a "red alert." The warning was later downgraded to orange, as the volcano became less active. Activity at Tungurahua -- which means "throat of fire" in the native Quechua language -- peaked Saturday between 8 a.m. and 2 p.m., according to the Geological Institute in Quito. At one point, the ash cloud reached nearly 3 km (1.9 miles) above the volcano's crater, according to the institute, and lava flowed about 2 km from the crater. The glacier-capped, 16,478-foot (5,023-meter) volcano has erupted periodically since 1999, when increased activity led to the temporary evacuation of the city of Banos at the foot of the volcano. Major eruptions also occurred in August 2006 and February 2008, according to the government's emergency management agency. Prior to this more recent activity, the last major eruption was between 1916 and 1918. Relatively minor activity continued until 1925, the Smithsonian Institution said on its volcano website. The volcano is 140 km south of Quito, Ecuador's capital. CNN's Claudia Dominguez contributed to this report.